What is a Dental Prosthetist? A Dental Prosthetist is a qualified Dental Technician who has had further education to become qualified as a Prosthetist. This means that they can treat patients directly. Dental Prosthetists are the only registered health providers trained specifically to make and fit dentures. 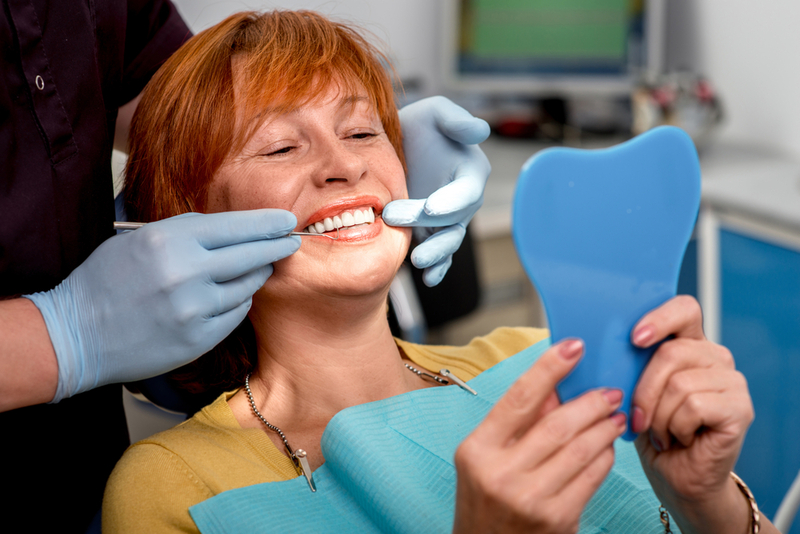 Dealing directly with a Dental Prosthetist enables you, as the patient, to have significant input into the design, colour and fit of your denture. Do I need a Doctor's or Dentist's referral? No referral is needed from a Doctor or Dentist, patients can go straight to a Dental Prosthetist. A denture reline is a procedure where the gum fitting surface of the denture is replaced with a new “lining.” The whole procedure takes 3 hours to complete, and you can take your denture home that same day. What is the difference between chrome and acrylic? This removable partial denture usually consists of replacement teeth set in pink or gum coloured acrylic resin. One or more wire clasps are placed around the natural teeth to assist in retention of the partial denture. It is the best and most durable partial denture, made of a metal framework which clasps and rests on the natural teeth. The denture is also supported by your gums, without placing undue pressure on them. The teeth are shaped to receive the occlusal rests. Modern cast metal dentures are typically made of strong alloys such as cobalt-chrome, which are thin, like plastic, but do not break as easily. Will my dentures affect my eating? If it is the first time you are wearing dentures, eating with them will take time and patience. We always suggest to start with softer foods, not to go home and try to eat a big steak. Gradually more solid foods can be introduced and with time you will be able to enjoy most foods. You may notice you sound a little different at first. Your tongue, lips and cheeks will get used to your new dentures. Normally it is only a few days till you get accustomed to your new dentures. What is the best way to clean my dentures? Always clean your dentures over a sink full of water or over a towel on a bench. We recommend using a gel toothpaste, or a denture toothpaste and a denture specific toothbrush. You may soak them in a specialised commercial cleaning product, which can be found at Westside Dentistry. Natural teeth need to be professionally cleaned every 6 months, and it is no different with dentures. Westside Dentistry can professionally clean your dentures using an ultra-sonic cleaner which will restore them to their original “like new” state. Should I remove my dentures at night? This is completely up to each patient. Some patients like to remove them at night to give their gums a rest, but other patients choose not to for aesthetic reasons. It really is up to every individual. Do my medications affect the fit of my dentures? Yes, there are some medications that reduce the amount of saliva produced in the mouth, therefore affecting the fit and comfort of your dentures. There are products available that aid in saliva production. Dentures have a lifespan between 8 and 10 years. The reason for this is that your gums change with time, the teeth wear down and the plastic can become brittle. Having your dentures relined every 2 years can extend the life of your denture. Can you make a mouthguard for teeth with braces? Yes, we are able to custom make a mouthguard to accommodate orthodontic braces. How long does it take to make a mouthguard? The impression taking process is a 10 minute appointment, and our turn-around to make the custom made mouthguard is usually a few days. The mouthguard is then moulded to the impression to make a perfect fit. The mouthguard will be ready for collection after a couple of days turnaround. How much does a check-up and clean cost? If you are in a private health fund with dental extras, then it is No Gap. This appointment includes a check of your teeth, then they are cleaned and the scale is removed. If required, x-rays will also be taken. I hate needles. How can I avoid pain at the dentist? Westside Dentistry doesn’t use big, scary needles to administer anaesthetic. Instead, we use a system call The Wand©. It is a device that looks like a pen with a small needle at the end. When it is held to the gum, there is no pain. The Wand delivers the anaesthetic at an even pace, ensuring that there is no pain. As the anaesthetic is delivered in a targeted way, only the immediate area will be numb. This means that your tongue and half of your mouth won’t be numb when you leave. Westside Dentistry understands that people can be reluctant to go to the dentist. We are fortunate to have Dr Jay as the practicing dentist, who prides himself in delivering a gentle and thorough service. What type of whitening service do you provide? Westside Dentistry provides a take home service. You come in and impressions of your teeth are made. Then come back a week later to collect your custom fitted whitening trays and your take home kit. The dentist will teach you how to use it. My child has a baby tooth with decay. Is it worth getting it fixed? Baby teeth are important for proper chewing and eating, providing space for the permanent teeth and guiding them into the correct position, the development of normal speech as well as contributing to your child’s attractive appearance. Unfortunately, sometimes the tooth has simply deteriorated beyond repair and needs to be extracted to avoid ongoing pain/infection, so it’s best to have any small holes fixed as soon as possible. I snore a lot and am worried about having sleep apnoea. Is there anything that you can do? Come in to see the dentist for an assessment. You will be referred to a sleep specialist who will guide you through a sleep test. When the results of this test are determined, you may need an oral appliance to help combat your snoring. For more information on this, read our information page (insert sleep apnoea link here). Veneers are a custom made shell-like material which is permanently bonded to the tooth, to give a natural look and feel. They are durable and strong, and can be fitted in only two visits. We recommend brushing your teeth with a soft tooth brush twice a day. Each brushing session should last 3 minutes. You should also floss every day. If you notice that your gums are bleeding when you brush or floss, or you have bad breath, loose or painful teeth or sensitive teeth, book an appointment with Westside Dentistry so that the dentist can determine the issue and tackle it early on. Composite filling material is used to create white, natural looking fillings. They last a long time and can be used not only to treat cavities, but to also improve the look of your teeth. The Wand is used to numb the area where a wisdom tooth is to be extracted. Often times wisdom teeth need to be extracted if they are impacted, as they can cause further issues with other teeth, and can become painful from infection. Talk to Dr Jay about your wisdom teeth options. I am pregnant. Can I still have dental treatment? Yes all general dental procedures are safe to have whilst pregnant.